Starting in 1988, Rob Dunn was keeping the wheels turning at California Closets, serving as CFO and VP Operations at the famous closet company's corporate offices in California. After the company's sale to Williams-Sonoma in 1991, Rob rejoined Neil Balter, California Closets' founder, to create Organizers Direct, bringing the same high quality storage solutions to market at a lower price point. But there, their stories begin to diverge. Longing to return to his native New Orleans, in 2002, Rob decided to become a distributor of the Organizers Direct products he'd helped introduce and Bayou Closets was born, bringing his over 25 years of storage and design expertise to tame the closets of the Greater New Orleans and Southeast Louisiana markets. Lover of organization, functionality and design. 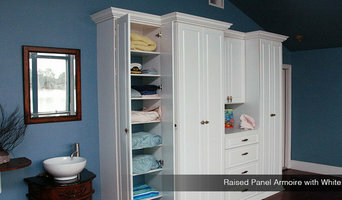 Specialize in closets, entertainment centers, garage storage and office design. Over 100 of my designs have been installed. NOLA Closets is a locally owned New Orleans storage and closet design company that provides beautiful, functional, and eco friendly custom storage solutions for every space in your home. Whether you’re in New Orleans, Metairie, the North Shore, or the West Bank, NOLA Closets will design and install the perfect custom closets, garages, pantries, laundry rooms, and more for your unique lifestyle. When life gets too cluttered, call on Clutter Clearer, LLC to help get organized! Let a professional organizer help you take control of your surroundings, your time and your life! From designing an efficient closet scheme, uncluttering any room in your home or office, to organizing a move, let Sally Johnston of Clutter Clearer, LLC clear the way to a more organized home or business! "My goal is to help you create a healthy, pleasant and functional space in your home, and reduce the clutter causing chaos in your life." Overwhelmed by your photos? We can help! We manage lifetime photo collections for busy people to bring them peace of mind and years of enjoyment. Let's gather your photos from their boxes, bins, phones, computers and camera cards so that we can organize, scan and back them up. Let's convert your old film reels and video tapes to a digital format. Then we can create ways for you to enjoy those precious memories today and for generations to come. Professional organizing company dedicated to helping individuals and businesses find personalized solutions to get and stay oganized. California Closets has been serving the Southern Louisiana region since 1984, creating beautiful, yet extremely practical storage systems for homes and businesses. Discover how California Closets can transform your home today by setting up a design consultation or visiting our showroom, right here in Metairie. The Metairie showroom is located at 3211 N. Causeway Blvd, right across from Lakeside Mall. Come see our showroom displays to get an idea of what our custom storage solutions look and feel in a real home setting. California Closets Metairie is run by a lifelong resident of Louisiana, who understands Southern Louisiana homes -- and people. Acknowledging that no two clients are the same, our Design Consultants are able to provide you with a distinct and unique storage design that embraces your belongings and the way you use your living spaces. When it comes to building your home storage solution and its installation, our expertly trained installers bring your vision to life in the most courteous and professional manner. We know that it is an honor to be invited into your home and we do our best to ensure that all installation is, quick, quiet and as non-invasive as possible. From home offices and garage storage to kitchen and cabinet design, California Closets New Orleans will work with your space, budget, and specific needs to design and install the best storage solution possible. Visit Our Metairie Showroom When you schedule a design consultation with one of our professional and knowledgeable designers, you will be impressed by their expertise as well as their friendliness. They will be able to help you choose the best personalized solution for your unique space. We also invite you to come visit our showroom at 3211 N. Causeway Blvd in Metairie, LA (70002), right across from Lakeside Mall. Our showroom features completed designs that will give you a concrete idea of what your new custom storage solution can look like. Our staff is on hand to answer any question you have. Local Products for Your Louisiana Home All of our products are made from quality, durable materials and are manufactured and customized for your home in our facilities in Southern Louisiana. We will install every piece of your custom storage system in your space, leaving you impressed and satisfied. 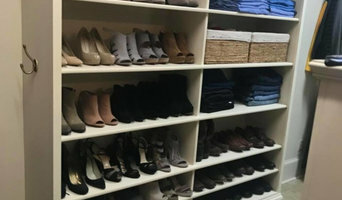 A Diverse Offering of Products Although a pioneer in the field of personalized closet systems, California Closets also has ample experience and expertise in customized storage and design solutions for other areas of the home. Our products cover systems that can be custom tailored for your home office, children’s room, kitchen pantry or even garage. You will not only be impressed with the quality of our products, but with their variety as well. What do New Orleans, LA professional organisers and storage designers do? A New Orleans, LA professional organiser can declutter your home and help you organise your possessions and furniture in a way that fits with your design vision. 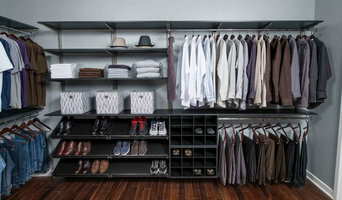 A home storage designer, on the other hand, can be hired to design custom wardrobes, shelves or other storage solutions to give you the exact storage space you need in your home. Some New Orleans, LA professional organisers will be able to coach you in how to declutter your life, as well as your home, so that you will learn how not to clutter or hoard anything in future. This is a great idea if your home is in need of a complete overhaul and you think that you have a problem with clutter and letting go of old possessions. Or, perhaps you have one particular room that has become overcrowded with clutter, such as the spare room, office or utility room, and needs some serious decluttering attention from a professional. Moving house is always a stressful time and can be made worse by having to deal with all the clutter, jumble and bits and bobs, so it could be worth hiring a professional organiser in New Orleans, LA to help you with your move and make sure your new home looks neat and tidy in no time. You can search for New Orleans, LA professional organisers with Houzz, see their previous projects and read reviews online before you contact them about your project. If you’re thinking of hiring a New Orleans, LA storage designer or professional organiser when moving into a new home, you may want them to discuss your design ideas with any other professionals working on your house project to make sure your storage solutions work with the rest of your design. Here are some related professionals and vendors to complement the work of home storage designers & professional organisers: Interior Designers, Furniture & Home Accessories, Design & Build. Find a professional New Orleans, LA professional organiser or storage designer on Houzz. Narrow your search in the Professionals section on Houzz to New Orleans, LA storage designers and organisers or look through storage and wardrobe photos and contact the professionals that worked on them.